TO BREAK THE RULES, YOU MUST FIRST MASTER THEM. ROYAL OAK CHRONOGRAPH IN PINK GOLD AUDEMARS PIGUET BOUTIQUE: LAS VEGAS: THE SHOPS AT CRYSTALS +888.214.6858 | AUDEMARSPIGUET.COM THE VALLÉE DE JOUX. 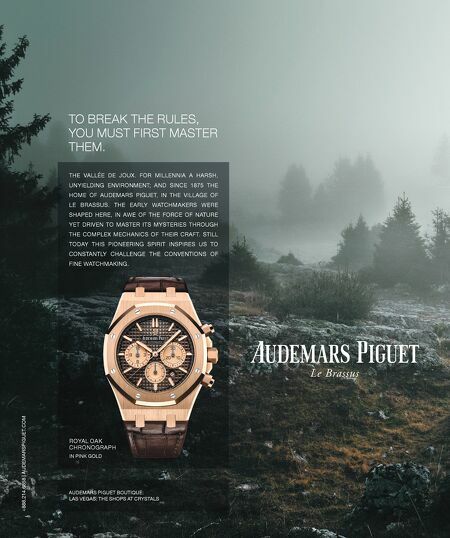 FOR MILLENNIA A HARSH, UNYIELDING ENVIRONMENT; AND SINCE 1875 THE HOME OF AUDEMARS PIGUET, IN THE VILLAGE OF LE BRASSUS. THE EARLY WATCHMAKERS WERE SHAPED HERE, IN AWE OF THE FORCE OF NATURE YET DRIVEN TO MASTER ITS MYSTERIES THROUGH THE COMPLEX MECHANICS OF THEIR CRAFT. STILL TODAY THIS PIONEERING SPIRIT INSPIRES US TO CONSTANTLY CHALLENGE THE CONVENTIONS OF FINE WATCHMAKING.